It's Your Night is the debut studio album by American singer-songwriter James Ingram, released by Qwest/Warner Bros. Records on July 27, 1983. The album was commercially successful, as it peaked at number 46 on the Billboard 200 album chart and reached number 14 on the Top Black Albums chart. It was later certified Gold by the Recording Industry Association of America (RIAA) in early 1984, making this his highest-charting album and only album to be certified by the RIAA. Ingram was nominated for four Grammy Awards in 1984 and 1985. The album cut "Party Animal" received a nomination for Best Male R&B Vocal Performance at the 26th Grammy Awards in 1984. It's Your Night and the album's second single, "Yah Mo B There" (a duet with Michael McDonald) received nominations for Best Male R&B Vocal Performance, Best R&B Song and Best R&B Performance by a Duo or Group, winning in the latter. It is also his first on Qwest Records, which was run by Quincy Jones. It features the song "Yah Mo B There", which is a duet with singer Michael McDonald. It has been certified gold by the RIAA and is his highest-charting album ever. Guitars: Larry Carlton, George Doering, Paul Jackson, Jr. Horns: Gary Grant, Jerry Hey, Bill Reichenbach Jr. The song Whatever We Imagine was used as the closing theme for both 1984 NCAA Men's Basketball Tournament and 1986 NBA Finals for CBS Sports. ↑ Music, All. 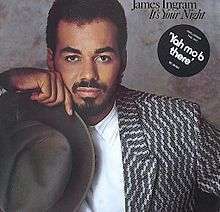 James Ingram: It's Your Night > Review at AllMusic. Retrieved 27 September 2011. 1 2 "James Ingram US albums chart history". allmusic.com. Retrieved 2011-09-27. ↑ "James Ingram US singles chart history". allmusic.com. Retrieved 2011-09-27. "How Do You Keep the Music Playing?" "(You Make Me Feel Like) A Natural Man"
"The Secret Garden (Sweet Seduction Suite)"
"I Don't Have the Heart"